What’s the best context in which to talk about the latest visit of The Giants? You could start from the most likely reason they were brought back, the positive economic impact. Whilst this may be the marker of success Liverpool Council ultimately base their judgements on, it’s only one piece of a story. It wouldn’t be the case if the Giant Spectacular didn’t work as an event. By this point it’s also difficult to evaluate The Giants from a purely artistic standpoint: their image has grown to almost supercede our real experience of them. 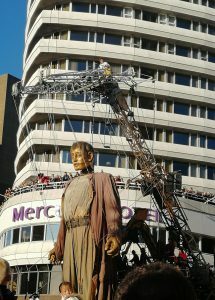 Although it’s undeniable that what Royal de Luxe’s creations are impressive. Watching them move is observing a hinterland between fantasy and truth. How they’re operated is not only observable, but made to be as much part of the spectacle as the puppets themselves. There’s no illusion here – and yet when you watch them move, look around and blink, you can almost imagine them as sentient beings. The additional accessories dotted around the city this year were also a nice touch. The best way I think there is of talking about The Giants is summed up by this image, captured by the Liverpool Echo’s James Maloney and widely shared on social media. I mean, what a sight. The Giant, the crowd, the city. What’s not to get excited about?? Here’s the thing: I was right in the middle of this crowd, standing somewhere near that raised group by what’s usually a crossing. We all stood there for more or less two hours, mostly waiting. It wasn’t too cold, but everyone was getting a little tired, uncomfortable and impatient by the time this moment happened. But as soon as the top of this Giant’s head appeared from behind the wall, it didn’t matter. Everyone was relaxed, everyone enjoying the show. This was billed as a “Spectacular”, and that was what we got. 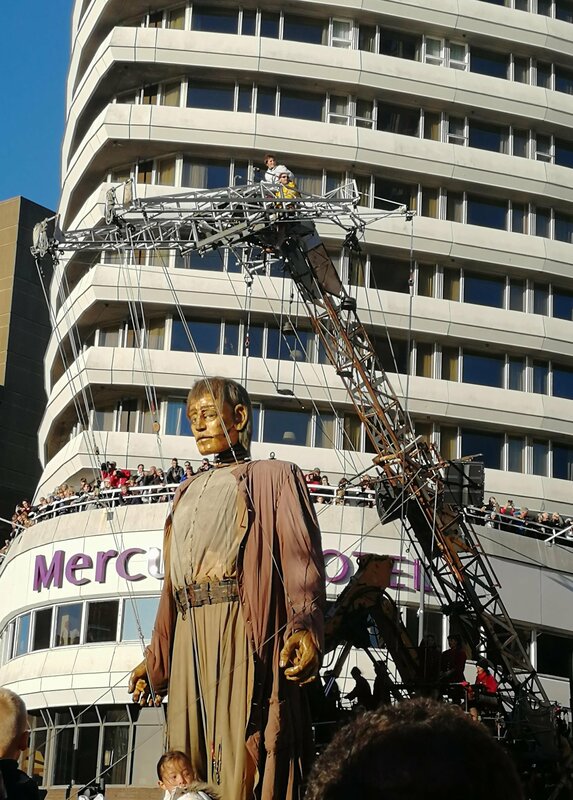 Watching the Giant move, observing the crowds around him and getting a drink out of a fire hose, was absolutely a fine spectacle. Not everyone has been so happy about welcoming the Giants back for their third visit, and some of this opposition comes across as a bit sniffy. I can’t lie, when I was freezing cold and getting rained on in New Brighton on Friday, I did wonder if it was special enough to be worth it. In retrospect I am happy to put this down to reacting predominantly to the weather. Other, less inclement-minded voices have been heard since well before this weekend, mostly just saying it’s all a bit terrible without much other justification. I think I’ve already covered the answer to this one. The second type of criticism – that Liverpool Council could have done more with their culture budget than such a safe bet – I do have more sympathy with. I don’t stand by those who call it boring: that’s like saying you don’t want your favourite band to play the hits when you see them live. 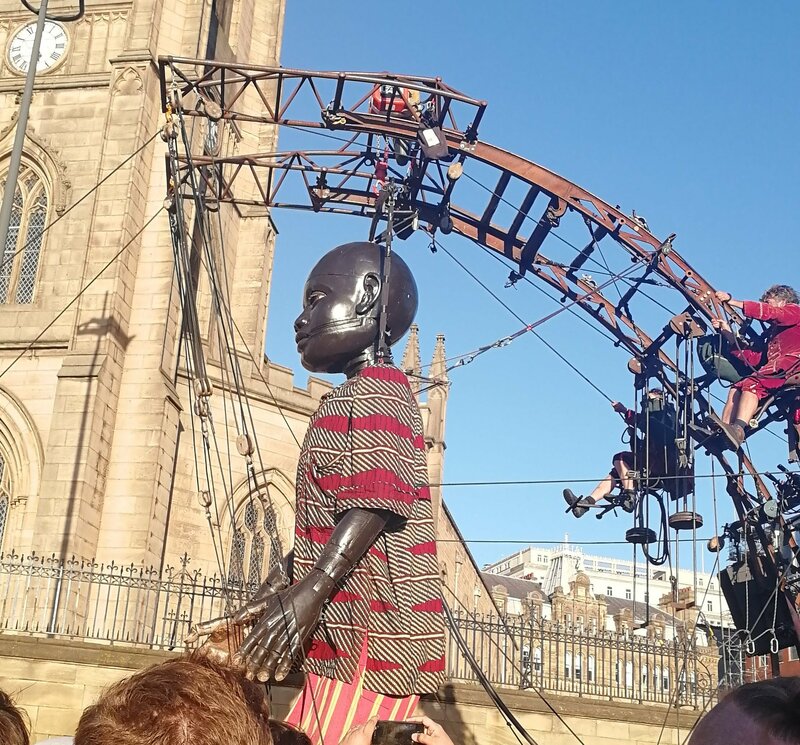 We all know you’re lying – and at least Royal de Luxe at least bring something a bit different to the table each time (Little Boy Giant sailing off in a shoe was this year’s particular twist. But the first two visits of The Giants might – should? – have been enough to prove that there’s an appetite for this kind of large-scale cultural event and to use it as a springboard for perhaps being even more ambitious. The danger of The Giants now being finished forever is that now the money’s spent, the council feel like they’ve done their duty. We now have to wait and see what the word ‘Culture’ now means in the minds of those making the decisions, and how they decide to move forward from the age of the Giants. The context in which we should be talking about The Giants now is related to how they made people feel. And regardless of the cold and the busy-ness, everything I saw led me to believe that the answer to that is “Great”. A technical and artistic achievement that brings unprecedented numbers of visitors from all generations to the city? That’s the sort of thing that makes history, and this October weekend has proven that The Giants have truly earned a place in Liverpool’s history. 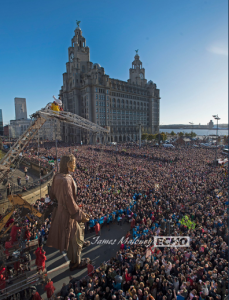 This entry was posted in Exhibitions, Home, Let's Talk About It, Past exhibitions and tagged art, Giant Spectacular, Giants, Liverpool. Bookmark the permalink.